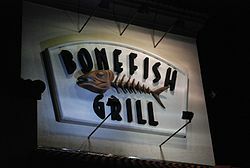 Bring your appetite, Jeannette, Isabella--for Bonefish Grill has a bulk deal you won't want to miss. For every $100 worth of gift cards you buy, you'll receive a $20 gift card free, up to a maximum of ten free gift cards. In addition, for every $1000 worth of gift cards you buy, you'll receive 10 percent off. Some restrictions apply on purchases with the gift card, but the web site does not say what these are. However, similar deals at other restaurants generally exclude alcohol, tax and tips. To qualify for the deal, the gift cards must be purchased between November 1 and December 31, 2013. The Bonus Cards are good from January 1, 2014 to February 10, 2014. You can either design your own or buy a pre-designed gift card. If you design your own, you can upload your own photo, write a message, and for a limited time only send it inside a greeting card free. Is this deal worth it? Yes, if you're buying a lot of gift cards--say, if you're the boss buying them for the office. Otherwise, it's a deal that's out of reach for meager budgets such as mine. What would I recommend? I would start with the Bang Bang Shrimp. In China, Bang Bang dishes are usually sold by street vendors who summon customers by banging two sticks together, hence the name. The Bang Bang Shrimp is crispy shrimp tossed in a spicy cream sauce. Other appetizers I'd consider are the Singapore Calamari (tossed with peppers and served with a sweet, spicy Asian sauce), the Ahi Tuna Sashimi (seared with sesame and served with wasabi and pickled ginger) and the Wagyu Beef and Ginger Dumplings (pan seared with shallots, soy sauce and spicy Thai peppers). For dinner, I'd go for the Sirloin Steak and Crab Cake Dinner--that's a 6-ounce center-cut sirloin with a Maryland Crab Cake (which are also available as appetizers). You have the option to upgrade the sirloin to a filet mignon, but the price for that is not listed. The Angler's Steak also piques my interest; that's a 6 or 11 ounce USDA Choice sirloin. Fish-wise, I'd choose either the Ahi Tuna (nicknamed "the filet of the sea") or the Jumbo Sea Scallops and Shrimp. The Grilled Fish menu selections come with your choice of sauce; I'd recommend the Warm Mango Salsa, the Chimichurri or the Pan Asian. The Baja Fish Tacos and the Bang Bang Tacos would be my choice of "hand-held" entrees. You can easily feed yourself and have money left over with the $20 Bonus Card. For some people that might be an incentive--or a guideline for how much to make each of the $100 of purchased gift cards worth.